The Little Drummer Boy is a popular Christmas song that was also the inspiration for a 1968 animated TV special by the same name. The song, written by Katherine K. Davis and later arranged by Henry Onorati and Harry Simeone, was originally written in 1941, but didn't become a hit until it was rearranged and released in 1958. Then it rose to #13 on the charts, even though it wasn't released until November. It's been a perennial holiday favorite ever since then. Read more about one of the best family holiday movies and Christmas songs. The Little Drummer Boy song was the inspiration for the 1968 animated holiday TV special by the same name. The screenplay was written by Romeo Muller, who also wrote the screenplay for other well-known Christmas specials, including Rudolph the Red-Nosed Reindeer and Frosty the Snowman. Although the film was based on the famous song, it included extra elements to expand the story. 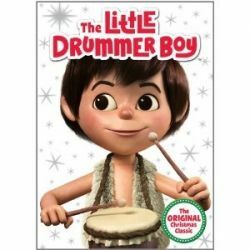 In the TV version, the little drummer boy (named Aaron) is an orphan who plays his drum for the baby Jesus. His life is changed forever when he meets The Three Wise Men on their way to Bethlehem and plays for the Christ Child. The stop-motion animated film was produced by Rankin-Bass. It first aired on December 19, 1968 and was then played annually for many years. NBC stopped airing it in 1984, and then CBS picked it up and showed it from 1985 to 1988. ABC was the third network to air the program, and it kept it in the annual holiday lineup through 2005. It is now broadcast by the ABC Family cable channel. This 1968 Rankin & Bass TV stop-motion TV special is still a wonderful holiday film to watch, and now you can own it on DVD or Blu-Ray. Today's Christmas specials may have better animation and special effects, but this 1968 TV special is a classic that I still love. The story (for those who haven't seen it -gasp!) is about an orphan named Aaron who stumbles upon the birth of baby Jesus and affirms what the holidays are really about - giving and love. Every day in December, Amazon offers free Christmas music downloads. You can now buy a child's nativity set featuring some of the characters from "The Little Drummer Boy" animated show, or you can buy the characters separately (as shown here). From Amazon: NEW for 2009! The Little Drummer Boy highly-detailed PVC figurines. Great for play or display. Recreate the adventure that lead Aaron and his animal friends to the first Christmas. Based on the Classic Rankin/Bass TV Special! This collection includes 14 PVC pieces in 3 boxed sets (you get all three sets): Set 1 includes: Aaron, the Little Drummer Boy Baabaa the lamb Samson the donkey Joshua the camel Set 2 includes: King Melchior with Gold piece King Balthazar with Frankincense piece King Gaspar with Myrrh piece Set 3 includes: Mary Joseph Baby Jesus in manger and a bonus Aaron, the Little Drummer Boy figurine (great for a separate decoration). three individual window boxes, by Round 2 / Forever Fun, 2009. This is a great collection for anyone who remembers all the classic Christmas specials from the 1960s, including The Little Drummer Boy and the others included here. One popular variation of the song features Bing Crosby and David Bowie singing a duet. It was recorded in 1977 for a Crosby Christmas special and is still popular today. If you like the Bing Crosby/David Bowie duet featured in the video above, it's available as an mp3 download from Amazon. Whether you love the song or the animated special, share your thoughts! Are You a Fan of The Little Drummer Boy? The Little Drummer Boy is a Christmas movie classic and the song is one of my favorites! Just becuase I had it on vhs and then dvd when the old player ate the tape doesn't meand a thing. Ok so it does. The story is great but the song is even better. one of the only songs that makes me cry,in a good way if you know what I mean? Yes, I like little drummer boy, especially that neat version with bing and bowie. I will feature it on my "Unique Christmas Music" lense at http://www.squidoo.com/christmas_music-1. I hope you can add my lense to your featured lenses here. Will also like and lensroll it. I know it's after Christmas now, but at least it should help for next year. Thanks for the backstory on this cute Christmas song. cute little movie, I want the grandkids to see it.